If you know me you know that I have wanted a baby since... well... since forever! I am permanently baby hungry. Unfortunately I haven't quite got my husband to the baby hungry point yet. :( maybe soon though! Ha ha until then I will soak in my sisters baby girl and my first niece. She is due in close to 3 weeks! I CAN'T WAIT! That brings me to my next thing.. Working at a mortgage company I dream about the day when we will be the ones getting a house.. I am now house hungry! In Feb. my husband and I decided we were going to try and buy, so we got with an loan officer and had our credit pulled. For anyone out there with the same name as someone in your family BEWARE! There were some mix ups, if you think there is only such thing as fraud hurting your credit think again! Make sure you check your credit, there might be some things on there that don't belong to you. So we had those things removed in Feb. and now we are just waiting. We have our eye on the place we want, but we are trying not to get our hopes up (even though, if it isn't corrected by the first of August that is beyond ridiculous) it is just hard not to! I can't help but load up my Pinterest with decorating ideas and look at pictures of the place EVERYDAY..ohh and think about the day when I can fill the rooms our babies! ;) ha ha so wish us luck, keep your fingers crossed! We sure hope it works out like we are planning. :) it is such a great opportunity! 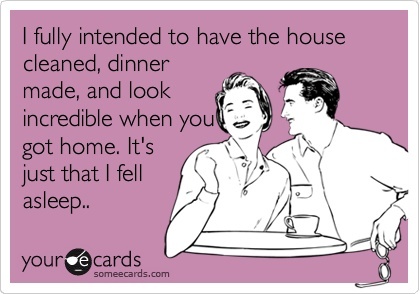 On a funny note, how many of you wives feel like this sometimes? Ha ha I laughed so hard when I saw this.. it is SO me!! hahah this is so funny because Jon and I are in the exact same (baby) situation. Im like dying to have one and he's like uhhhh. also the ecard is the story of my life. Love your blog, keep it up! and good luck with the house hunting! it's awesome having your own place!